Msgr. José Domingo Ulloa (Archbishop of Panama Ciudad) meet olive wood workers in Jerusalem. 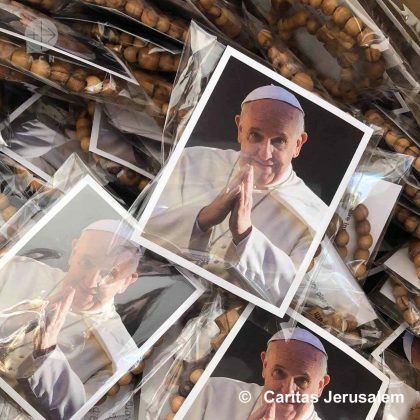 They produce the rosaries, which Pope Francis will distribute to the pilgrims on the World Youthday in Panama 2019. Olive Woord Rosary with a photo of Pope Francis. He will distribute to the pilgrims on the World Youthday in Panama 2019. The World Youth Day in PANAMA will be the launch-pad for a unique educational grassroots initiative that will gradually percolate to all of Central America. The DOCAT (= the catholic social teaching with a foreword and impulses from Pope Francis) will be distributed in huge numbers. A multitude of study groups will be formed. Archbishop Ulloa Mendieta of Panama says, “Nothing helps our youth more than education. Once they know the Christian social doctrine, they will also know how to fight corruption, end violence, establish democracy, make freedom happen and create wealth with the power of the Gospel”. Together with Pope Francis, he dreams of a revolution of love and justice that will affect all the countries of the region – from Mexico to Panama! DOCAT presented in the World Youth Day 2016. Pope Francis supports this with all his heart. He will distribute the DOCAT books and the DOCAT smartphone app to WYD Panama pilgrims as his personal gift. The host, Archbishop Ulloa, will invite the Central American pilgrims, in the opening speech and through the media, to enter deeply into the Catholic social doctrine. 25,000 Spanish DOCAT books and up to 1,000,000 digital versions are all set to be distributed. The only condition is: Whoever takes a book has to form a study group. (There is a free digital study guide to help animate these DOCAT study groups). All pilgrims can also download the DOCAT smartphone app which will also be freely available. Dedicated support and mentoring by 35 social doctrine experts from all over the world will also be available to the DOCAT recipients on how to work with catholic social teaching to build a fairer society. The project will be support from ACN (Aid to the Church in need) which is an organisation that is approved by the Vatican. On the XXXIV World Youth Day (WYD), the Catholic Church in Panama has decided to reveal the hidden face of the country. “When a foreigner arrives in Panama, he might think he’s in Dubai, but that’s just the façade,” says Archbishop José Domingo Ulloa of Panama City, the capital. This Central American country, which has some 4 million inhabitants, more than 80% of whom are Catholics, is preparing to receive Pope Francis, host of this major event that will take place from January 22 to 27, 2019. According to the World Bank, Panama is one of the six countries with the greatest inequality in Latin America and one of the ten countries with the greatest inequality in the world. “The WYD 2019 will be the occasion to discover the true face of our country”, said Archbishop Ulloa. 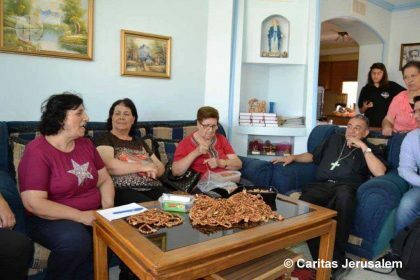 Last November, the Archbishop, a member of the Order of St. Augustine, received a delegation from the Pontifical Foundation Aid to the Church in Need (ACN) in his Diocese of Panama. Next to the wide and clean avenues of the capital, bordered by luxury shops, glass skyscrapers, bank branches and service companies—not forgetting the prestigious canal—Panama reserves its riches for the wealthy. “Panama has two faces. In the country, by 2015, the richest 10 per cent of households had incomes 37 times higher than the poorest 10 per cent. These figures reveal to us the social injustice and the high degree of inequality suffered by our people,” emphasizes the Archbishop of Panama. The fate of Afro-descendants is not to be envied. Their ancestors were African slaves exported to Panama in the 15th and 16th centuries, or people from the Antilles who came to work on the construction of the Panama Canal in the 20th century. These people suffer directly from poverty and marginalization. They live in poor neighborhoods and traditionally impoverished areas and provinces such as Colon, Darien and Panama. Afro-descendants are now mestizos. In addition, Panama has seven indigenous ethnic groups that represent around 10-12% of the population or half a million people. A significant part of this autochthonous population lives in a situation of serious marginalization and social exclusion. “The health status of these indigenous peoples is precarious—infant mortality is three times higher than in the rest of the population—and they also suffer from low levels of education and schooling. As a result, this indigenous population does not have access to well-paid jobs, as Panamanian society is essentially a service-oriented society. “From the outside they see a very proud Panama. They think we’re dealing with a Central American Switzerland, but we have to look beyond that: 40% of people work in the undeclared economy. There is a deep Panama that is not reached by development, while international cooperation reduces its aid because it considers Panama to be a developed country,” Maribel Jaen, from the Archbishop’s Justice and Peace Commission, explains to the ACN delegation. For the bishop, the strength of the Church in Panama is its laity, and the impact of the next WYD is already felt: many young people have been involved in the organization of this event. “It’s not just the Catholics; there are even non-believing young people who participate! 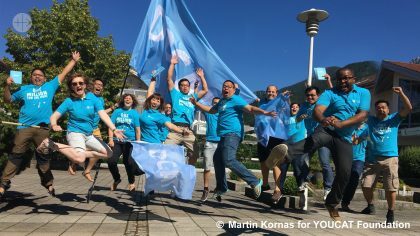 WYD is a blessing for youth ministry, but also a job opportunity for many young people. 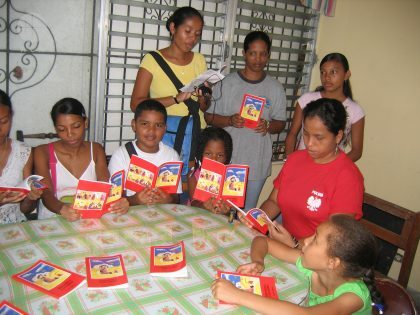 The child´s bible “God speaks to his children” in Spanish language (Missionary infancy, Panama). “The challenge will be the next day. It will be necessary to keep the dynamism of WYD, to continue the work, because there is the risk that the charismatic tendency prevails. Very present in Panama, this tendency is often based on the superficial, the emotional, the sentimental. Hence the importance of educating the faithful and the young, in the Social Doctrine of the Church,” says Maribel Jaen. Archbishop Ulloa also hopes that this WYD, in which 400,000 young people are expected to participate, will offer the opportunity to relaunch and deepen the Social Teachings of the Church, because, in his opinion, the small Church in Panama, which has only 6 dioceses, an apostolic prelature and an apostolic vicariate, needs a profound renewal. The Archbishop of Panama celebrates the fact that during the next WYD young people who are expected to attend can become familiar with the social teaching of the Church through the Docat Digital app. Provided by the YOUCAT Foundation, which is part of ACN, its goal is to help young people understand in their own language, by answering their questions, this important aspect of Christian commitment.